Lately, I've been into experimenting with teas and herbal infusions as smoothie bases. As much fun as all of this kitchen witchery is, sharing the findings makes it even more so. Each week, I'll post a new recipe based on the results of my kitchen playtime. Here's last week's post sharing my easy green smoothie recipe. Trendy golden milk has been turning insta feeds deep yellow for a couple of years now. Tumeric, the main ingredient in golden milk, was popular long before it got a cool name and a Valencia filter. It's one of the most-used spices in Ayurveda. It benefits a variety of systems and functions in the body, including the digestive system, brain and nervous system, immune system, and circulatory system. Typically, golden milk combines turmeric with ginger, black peppercorns, cinnamon, coconut oil, and coconut milk. This week, I challenged myself to find a way to turn those ingredients into a smoothie. Making smoothies using infusions always begins with a little prep the night before. I chopped up some ginger and turmeric, adding two tablespoons each to my tea infuser along with a teaspoon of peppercorns. I infused all of this in about two cups of boiling water. It's a lot of flavor, but the situation sort of demands it. 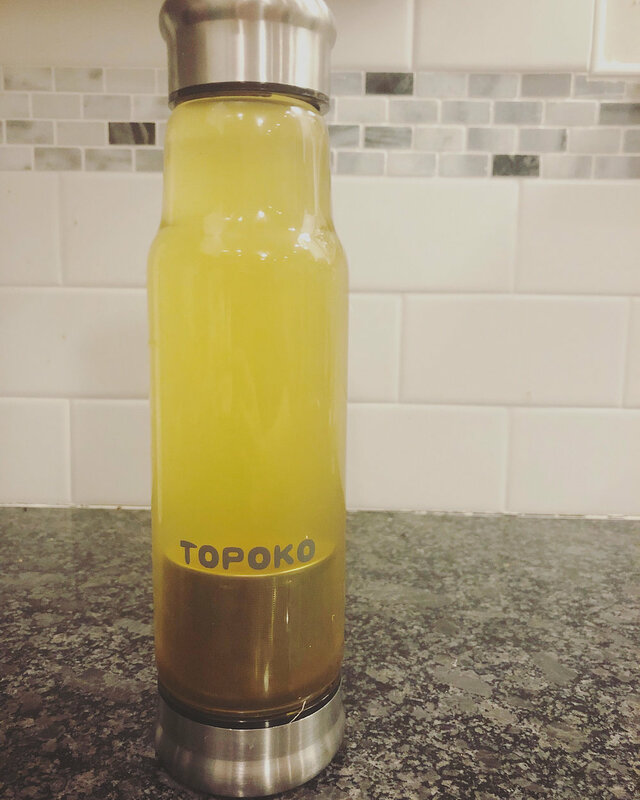 I like to use a Topoko bottle to infuse herbs, teas, and spices overnight. It's also great on-the-go. Assembling the smoothie is fairly easy, but there are a few little tricks to make it even better. Rather than just throwing the infusion, non-dairy milk, cinnamon, coconut oil, and banana to the blender as they are, I recommend using frozen banana and getting the coconut oil to a liquid consistency if it's not already. If you run the jar under water for a minute or two the coconut oil will begin to melt. If you like your smoothies a little chilly, which I do, peel a banana the night before, chop it into a few pieces, and freeze on parchment paper. Once those little tasks are complete, just add everything to the blender and run until smooth. 1. Add turmeric, ginger, and peppercorns to an infuser. Pour boiling water over the spices. Let cool, then refrigerate overnight or for at least 8 hours. 3. Just before adding all of the smoothie ingredients to the blender, melt the coconut oil by running the jar under water. In warm climates, you'll be able to skip this step. 4. Add the tumeric-ginger infusion, banana, coconut oil, coconut milk, and ground cinnamon to blend and run until smooth. I'm a fan of all things green and citrus-y in the morning (like my easy green smoothie), so I'm thinking of this one as more of a mid-afternoon treat. It might even work as a dessert!